Is this saying that its easy to predict bet sizes? I would have to say that it is and we don't need a computer to figure that out. I would think that most players would raise the same amount pre-flop (say, 3 times BB) and then predictably the same amount on the flop (with a .5x pot CB) and so forth. I don't see anything staggering about it. Its actually good practice to make your bets uniform so opponents don't put you on a hand, yes? One of the things that scares me the most about online poker is the possibility of bots playing, although this particular study doesn't worry me (three decimal places, really? Hooey. Even a rank amateur like me varies my bets in virtually every situation). Simpler games like Limit Hold 'Em will be conquered soon enough, and the best computers should be able to outperform all but the best No Limit players before too long (5 years???). And I actually have some street cred on this subject, because I can no longer beat the latest beta version of THETA Poker, which is severely handicapped by running on an iPhone (instead of a multicore server) and my much-worse-than-yours playing skills (I guess that means I'm a better programmer than No Limit Hold 'Em player, but that doesn't make me any happier). 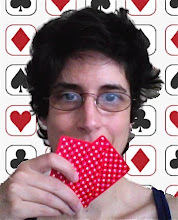 Cardgrrl, I'd be honored if you'd accept and try out a free copy of the new version once it's released (or now if you don't mind a few beta hassles), because I'd love to hear what you think. If you read the study and look at the data it's obvious that it was conducted on a limit game (looks like .25/.50). Is predicting betting amounts in a limit game really that ground breaking? It wouldn't be hard to make a bot for .25/.50 LHE. What's scary is thinking a winning 100/200 LHE or higher player could take his knowledge of the game, have someone set up a bot and then drop down lower to like 30/60 and kill the game.